This is not the first time that Microsoft is notifying users about the benefits of trying out Microsoft Edge. The company notified Windows 10 users previously that Edge was doing better battery-wise than Google Chrome. Windows 10 users receive the message as an overlay popup that hovers over the Edge icon in the Windows 10 taskbar. 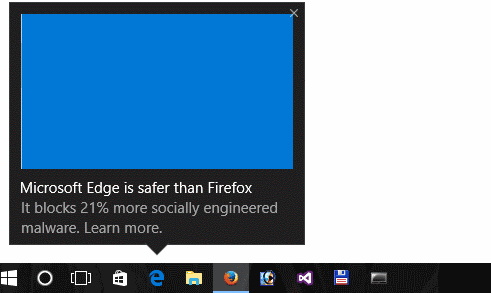 It states: Microsoft Edge is safer than Firefox. It blocks 21% more socially engineered malware. Learn more. A similar message is shown to Chrome users but with a smaller difference. The data is taken from a test conducted by NSS Labs recently which saw Edge block 91.4% of phishing URLs and 99% of social engineered malware. The percentage values for Chrome were 82.4% and 85.8%, and for Firefox 81.4% and 78.3%. Side note: NSS Labs has a long standing relationship with Microsoft. According to NSS Labs, the research was independent and not sponsored by Microsoft. 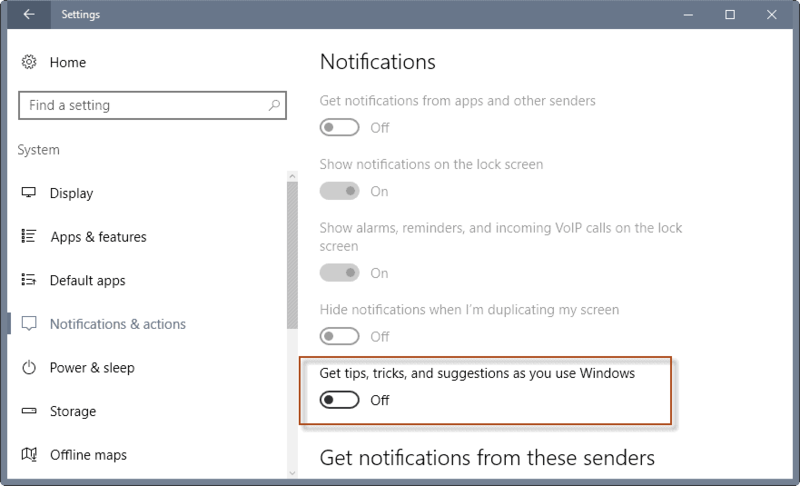 The popup notification is part of Microsoft’s “Windows Tips for Windows 10” campaign which launched in early November. According to Microsoft — via Venture Beat — the tips are created to “provide people with quick, easy information that can help them enhance their Windows 10 experience”. Microsoft Edge is not doing as well as Microsoft hoped it would. If you check NetMarketShare for instance, you will notice that it has a overall usage share of about 5% and is not gaining any traction. While the data covers all operating systems, it is fair to say that the current performance does not meet Microsoft’s expectations for its new browser. It is clear that the way these notifications are pushed to Windows 10 devices is controversial. Windows 10 users who run third-party browsers like Firefox or Chrome have done so deliberately. They have downloaded and installed the browser, and maybe pinned it to the taskbar on top of that. It seems unlikely that Microsoft is going to convince many to switch over to Microsoft Edge with these notifications. The main issue that users may have with the popups is not that they are displayed in first place, but that there is no clear option to block them on the system. I suppose that there are users out there who are interested in the data, especially since it highlights areas of interest such as battery life or security. Locate “Get tips, tricks, and suggestions as you use Windows”, and switch the preference to Off. Tips: Click here to find out how to turn off Lock Screen ads on Windows 10, and here to turn off the Microsoft Consumer Experience. This entry was posted on Friday, December 2nd, 2016 at 11:08 am	and is filed under General News. You can follow any responses to this entry through the RSS 2.0 feed. Both comments and pings are currently closed.